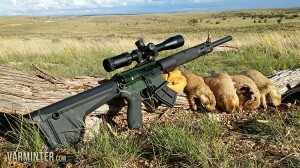 The Franklin Armory F17-L with a few prairie dogs in Northern Arizona. The Franklin Armory F17-L in .17 Winchester Super Magnum has a lot of firsts. 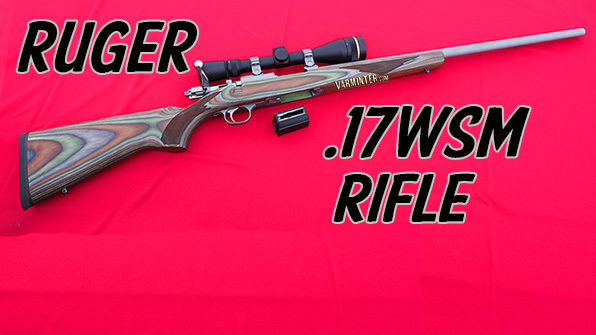 It is the first semi-automatic rifle in .17WSM now available to the general public. 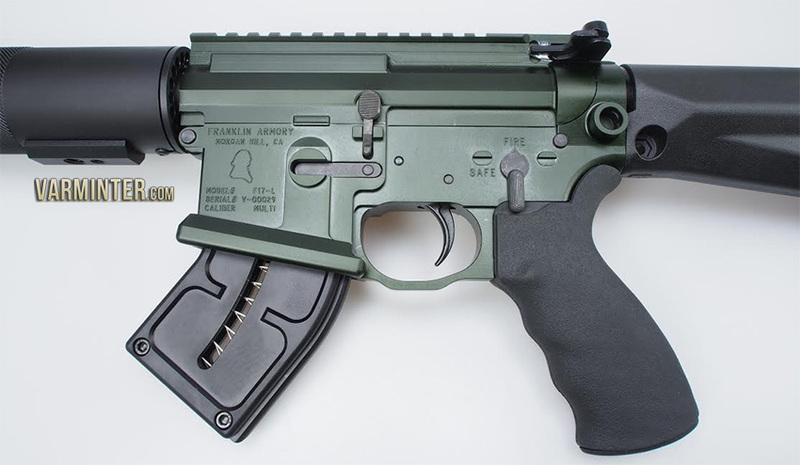 It is the first gas piston system, AR15 rimfire rifle (built in partnership between Franklin Armory and Osprey Defense). 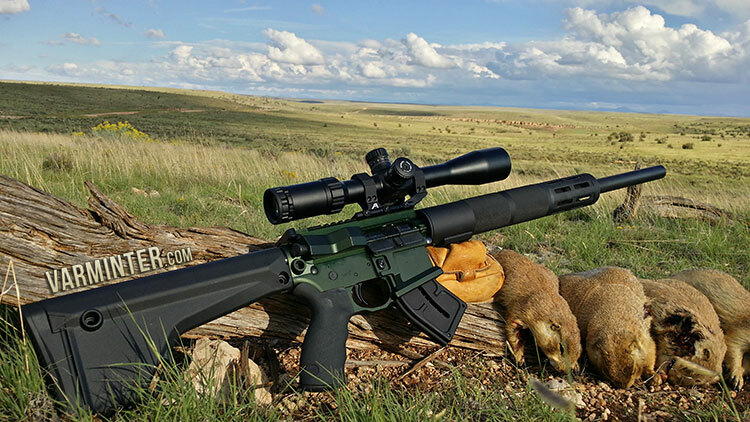 Lastly, it is the first AR15, chambered in .17 Winchester Super Magnum, to head to Arizona and wreak havoc on the prairie dog and rock squirrel population! Thankfully, we were the ones shooting it, so we’ve got lots of pictures and videos of the rifle at work, as well as a review and hunt report, with video. Franklin Armory F17-L with Hawke Sidewinder 30 Tactical in an Aero Precision Extended Mount ready for the range. The F17-L arrived a few days before our scheduled trip to Northern Arizona. It was shipped directly to our review editor, Will Chambers. 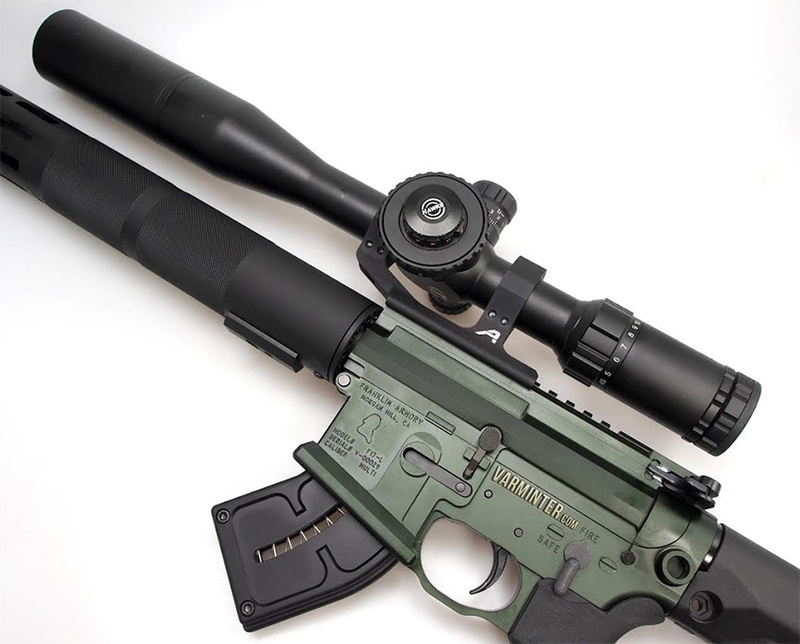 After receiving the rifle, Will mounted a Hawke Sidewinder 30 Tactical scope in an Aero Precision Ultra Light Extended mount. 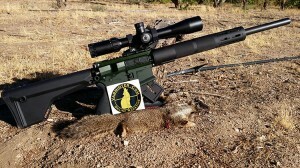 We were both familiar with the scope, so we decided that it would be the best choice for this rifle while hunting prairie dog sized animals at various ranges. After meeting Will at the Los Angeles airport, we packed up his things in my truck and headed to one of the private ranches up in Central California that I have access to. Our plan was to get some range time in with the rifle and make sure we were dialed in for the hunt. Then, we would head to another farm outside of Bakersfield to get in a little shooting, before heading east to Arizona. Because it was Will’s first trip out west for a true varmint hunt, I could tell that he was excited to see one of my hunts in person, then get to do his own over in Arizona. Before we sat down at the bench to shoot, I got a chance to really look at this rifle. If you subscribe to our YouTube Channel, you probably saw the first version of the F17-L when we interviewed the Franklin Armory folks at the 2014 SHOT Show. The rifle we received was the final version, that obviously showed a lot of thought and effort behind its creation. The first thing I noticed was how it matched Franklin Armory’s standard AR15 rifles. In fact, the F17-L is built using Franklin Armory’s very popular Libertas Billet lower receiver and Libertas Billet upper receiver. The only changes Franklin Armory made were to the adapt the barrel, bolt-carrier group, buffer and create a new magazine to handle the .17WSM cartridge. It has the feel of a well-built rifle that is a far cry from some of the issues people have with the Savage B.MAG. We did a thorough take-down of the rifle, checking all the parts and making sure everything was clean and lubed properly. Putting it back together was no different than any other AR15, quick and easy. 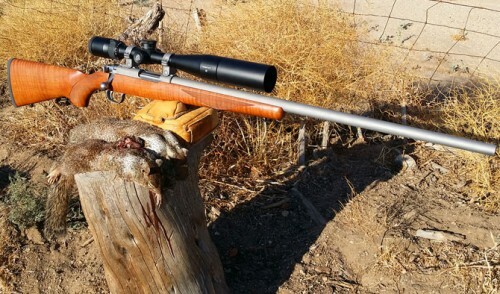 The rifle handles very well and even after hauling it around for a week, I felt the 9 pound weight (approx 11 pounds with scope & mount) was still manageable for a mobile varmint or predator hunter. The Magpul MOE Rifle stock made for a perfect cheek weld and the added feature of an integral tripod adapter on the handguard gave a great option to drop it on a stable platform for some longer range shooting when a bench is not an option. Weight without magazine: 9 LBS. Our range time was spent shooting a dozen or so 10 round magazines at our target, set-up 95 yards away. We took turns shooting the rifle, occasionally performing the mandatory “mag-dump” of all 10 rounds so we could check the cycling of the 20 grain Winchester cartridges. We were satisfied with the performance and Will ended up with the best group of the afternoon, right at .82″, with Will’s largest group of the day being 1.25″. My best group was only 1.33″, but I take the blame for the flyer that ruined that group. 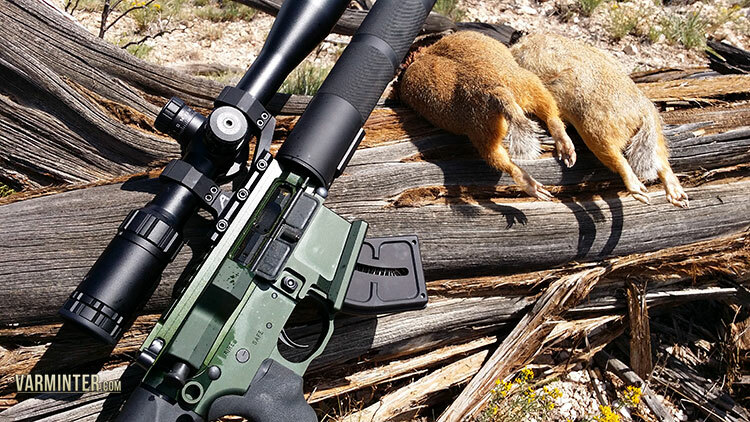 Either way, with this rifle performing at averages of 1″ at 95 yards, we were more than happy with the group sizes. 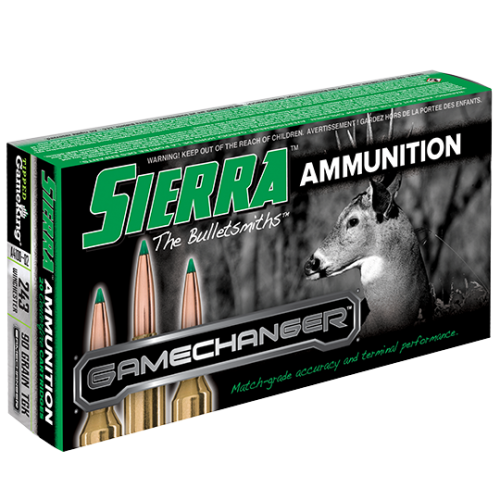 The chronograph results, out of the 20 inch barrel, put the 20 grain bullet just under 3000 fps and the 25 grain just below 2700 fps. 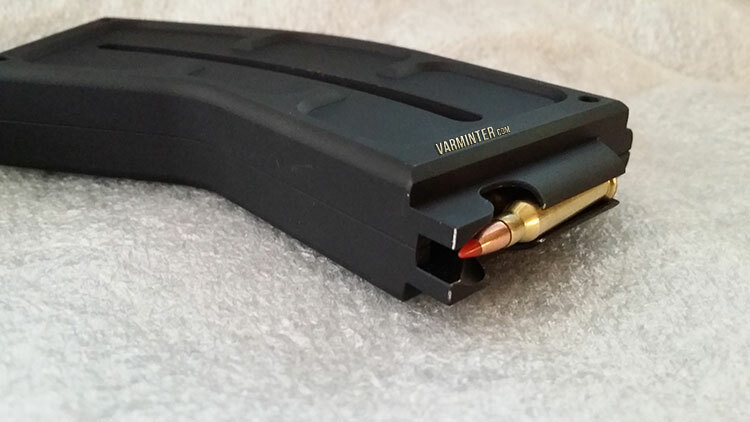 Loading the magazine was pretty straight-forward and the need to have the rounds stack correctly for proper feed was never an issue. The only complaint I have about the magazine was the difficultly in loading the 9th and 10th rounds. It was stiff and is begging for some type of simple tool to make the loading easier. After we shot for a while, it started to get a bit cooler, so we decided to try and squeeze in a quick hunt before the sun went down! I was eager to draw blood with this rifle, so we ended up driving to a small farm that I have not hunted in quite some time. The last time I was there, it was loaded with ground squirrels, but the late afternoon heat of the Central Valley normally keeps most of them down. However, after we arrived, we found that there was one area with ground squirrel activity, so I got set-up with the F17-L and Will manned the camera. 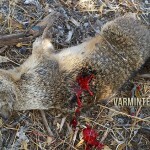 Typically, ground squirrels will stop and give you an opportunity to take the shot. These were not being cooperative, so we could only watch the shadows under the fruit trees, as the ground squirrels ran back and forth from tree to tree. Will’s excitement started to bubble up as the squirrels showed up, then disappeared. I would hear a loud hiss, “There’s one, right there!”, followed by an “Oh, he’s gone.” It was funny the first few times, but I started to stress about making the shot when it finally presented itself. I didn’t have to wait long. A few seconds after having that thought, a ground squirrel crossed the open ground and hesitated in the shade and tall grass. I held right on and squeezed the trigger… A miss! He didn’t know where the shot came from, so he actually ran towards us, where I missed again! He disappeared for a few seconds, but that was all the time I needed for my brain to process what had happened. 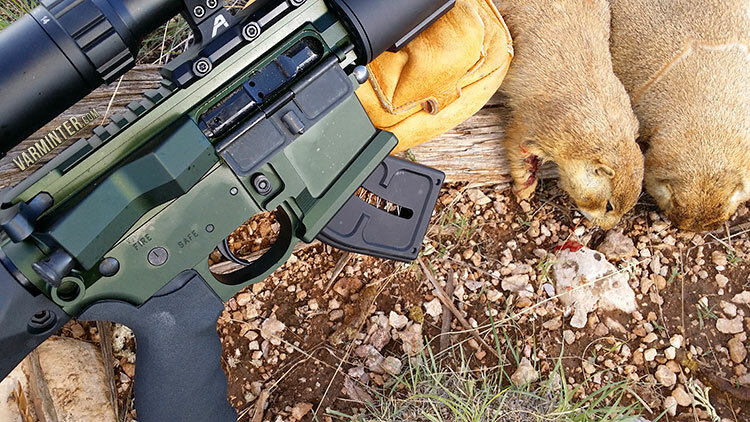 It was simple, we sighted in at 1.5″ high at 95 yards, so with him running closer to us as he crossed the open area, I shot over him by about 1 inch. Suddenly, his silhouette showed in the shade and grass. I held appropriately and rolled him with my third shot! Now I’m pretty fast with a bolt-action rifle, but having the ability to follow-up my shots immediately with the F17-L made a huge difference in taking this squirrel! We took some obligatory pictures of the first kill and then hit the road to get dinner. 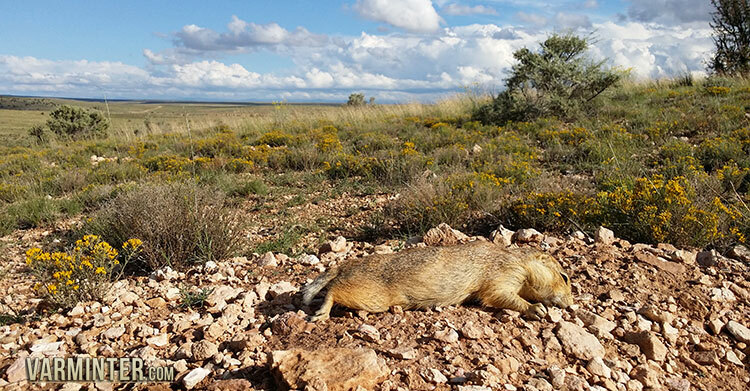 The excitement of prairie dog hunting was building, but so was a storm system that was mixing with the monsoons in Arizona, called Hurricane Norbert. 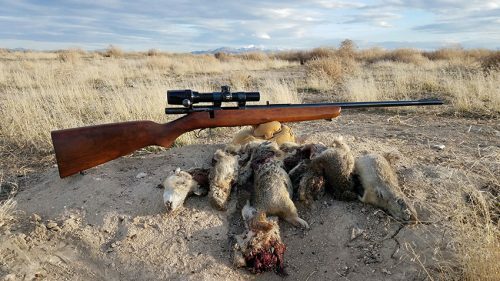 Since the weather was calling for extreme rain and flooding for both Sunday and Monday of our trip, we decided to take our time leaving California, allowing me to hunt the same ranch for ground squirrels on Sunday morning. The Franklin Armory F17-L with the first of many varmints. We woke up early Sunday morning and loaded everything in my truck for the 7 hour drive to Arizona. Before heading out, we planned a stop at the same property we hunted the afternoon before, for a chance at more ground squirrels with the F17-L. As we pulled into the farm, we were not disappointed. There were squirrels running everywhere! Unfortunately, there are only a few places that can be hunted on this particular ranch, so we set-up about 75 to 85 yards away from a large brush pile next to an alfalfa field. Most of the ranches I hunt have these types of brush piles and they always seem to hold ground squirrels, so we were hoping for some good shooting. The author with 3 ground squirrels taken with the F17-L.
About 15 minutes after getting set-up, I spotted a cottontail rabbit feeding along the edge of the alfalfa field. I watched it feed through the scope for a few seconds when a ground squirrel popped out of the brush directly behind the rabbit. Remembering my mistake from the evening before, I took my time placing the crosshairs in the correct spot on the squirrel, then pulled the trigger. At the shot, the ground squirrel dropped backwards a bit and began to twitch a little. It was a head-shot and dropped him immediately. 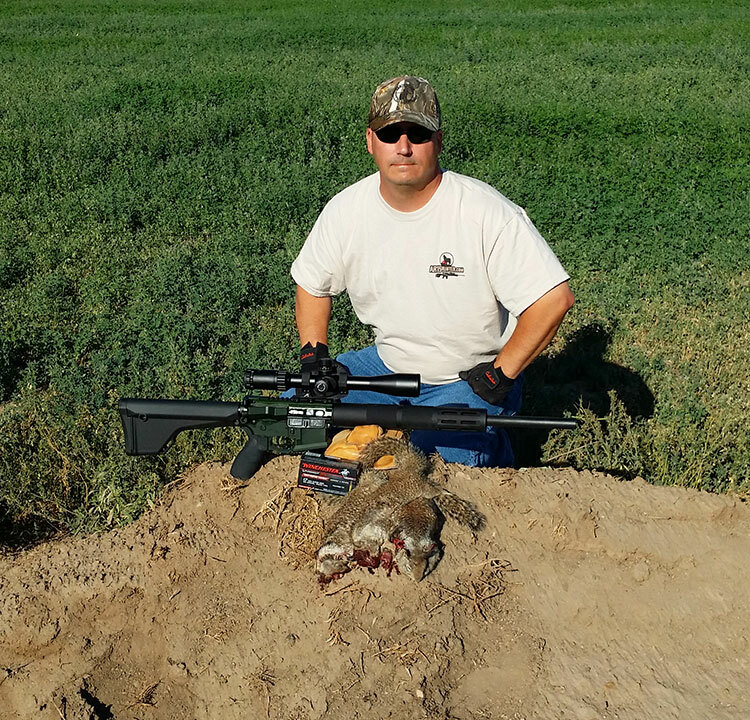 At the shot, I noticed some movement on the far right edge of the scope, so I adjusted the rifle and dialed in on a pair of ground squirrels towards the top of the brush pile. One was laying out on his belly, while the other only offered a shoulder/head shot. I decided to shoot the one laying out. I laid the center crosshair at the base of his chest and took the shot. Unfortunately, Will wasn’t looking at the same ground squirrel I was, or he would have seen the impact of the 20 grain bullet launch the ground squirrel up and off the branch a couple of feet. He was dead and didn’t even hear the shot. The squirrel that was next to him dropped down, but popped up a moment later a few feet away. I only had a small window for a head-shot between some branches, but I was starting to feel comfortable with the F17-L, so I threaded the bullet in and killed him with the crack of the bullet hitting his skull. 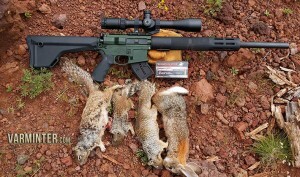 Three ground squirrels down in just a minute or so, with no thought to work the bolt, or break-open the action of a rifle. The semi-auto Franklin performed flawlessly and let me concentrate on the shots. Three hits in a row also gave me a huge boost in confidence, as I began to realize that this rifle was performing as well, if not better, than at the range. We took some more pictures, even posting one to our Instagram page, then we hit the road for Northern Arizona. Three more ground squirrels taken with the F17-L and the 20 grain .17WSM ammo. Sunday afternoon was spent driving through large monsoon showers that either gave us beautiful views in the distance, or left me driving just fast enough to stay within the disappearing lines on the highway. It was brutal, but the worst of it was supposed to hit the following day. When we hit Flagstaff, we checked-in at the motel and hauled all our rifles and gear into the rooms to get everything sorted for the next day. Our plan was to meet up with a friend of mine who lives in Flagstaff to discuss some new areas he and I had been investigating for a couple of months. Afterwards, we were going to hit a local area that is open for shooting to re-sight our rifles, since we had gained a few thousand feet in elevation and traveled quite a bit, with our rifles bouncing around in the back seat of my truck, I felt this was necessary. The morning was raining, but it was starting to break-up right after breakfast, so we decided to get loaded up and hit the shooting spot. Parked on the side of the highway checking out the monsoons in the distance. As we arrived at the spot, I could see movement up in the rocks. I was immediately on the binoculars checking out the area. Rock Squirrels! Rock squirrels look almost exactly like our ground squirrels in California, but live mainly in rocky areas of Northern Arizona. We quickly got some targets set-up and sighted-in our rifles. 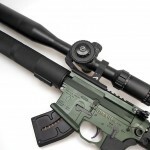 The plan was for me to shoot the Franklin Armory F17-L for the week, with Will shooting his custom AR15 in the 5.56/.223 caliber, mainly shooting the Australian Outback ammunition. We both finished with our sight-in, so we set-up the camera and started looking for some of the many rock squirrels that had been chirping at us while we shot. 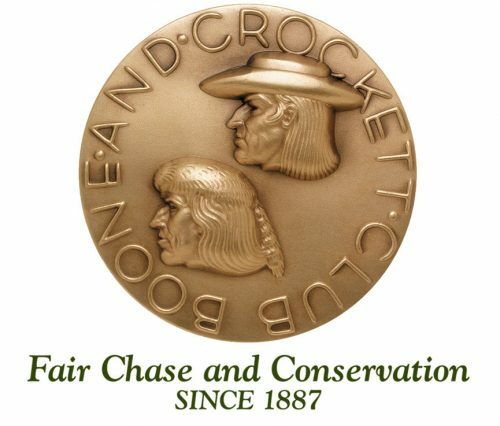 We spotted a couple on a rock-slide area about 80 yards away on a steep hill. Will found them with the camera, while I got set-up with the F17-L. Within a couple of minutes, two squirrels were laying dead up on the hillside. As I glanced over on the far hill, I noticed some movement right next to a rock squirrel Will had shot a few minutes earlier. Sure enough, it was another squirrel coming down to eat some of his dead buddy. I let it nibble while I adjusted for the shot. The hillside was steep and Will had ranged it earlier at 110-115 yards. Just as the squirrel popped out from behind a small bush, I dropped him with a shot. “Man”, I thought, “This rifle is on!” After collecting the squirrels, we took some pictures, packed up and headed for the long drive to where we hoped to find some prairie dogs and no rain. A few rock squirrels and a cottontail taken with the F17-L.
We reached the general area where we were going to scout for prairie dogs and found that the rain had passed, but left a muddy mess on most of the roads. This didn’t deter us, so I popped it in 4WD and headed down the road into the grasslands. After an hour, or so, of driving, we had seen only one other person and he was scouting for elk. We were truly in the middle of nowhere and still hadn’t seen any sign of prairie dogs. It’s normally about the time you feel like your day has been wasted, that something really good happens to change your entire attitude. This moment was no different. As we slowed to check out an area for some possible predator calling, I heard the familiar “bark” of a prairie dog. It was very windy and at first I thought it might be a bird chirping, but when we stopped to listen again, the prairie dogs really started in on the warning barks! We had found some! We quickly took a look at the valley that held the colony of prairie dogs and determined that a hillside on the far west side would be the best spot to get set-up. We drove through the valley and saw a few prairie dogs running to their holes. There was not a huge number of them, but there were enough to make for some decent shooting. 240 yard shot from the distant hillside. We set-up on the hillside with the Caldwell Stable Table and a few sand bags. 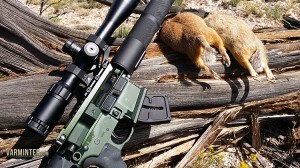 Because Will had never shot a prairie dog, I let him smack a few with his AR15. After we had figured out some of the groups that were most active, it was time to pull out the F17-L. At the bench, I had to get the rifle a bit higher to clear the magazine. This was not an issue, as we were facing down a hill, so I stacked a couple of shooting bags to make for a solid rest. It wasn’t long after I let the charging handle fly that we had a target in sight. He wasn’t far, only about 113 yards, so I held a little low on his chest and killed him instantly. Right when the round cycled, Will spotted one in the 144 yard range, so I re-adjusted and we watched him move a bit before finally settling in to eat on a small bush. 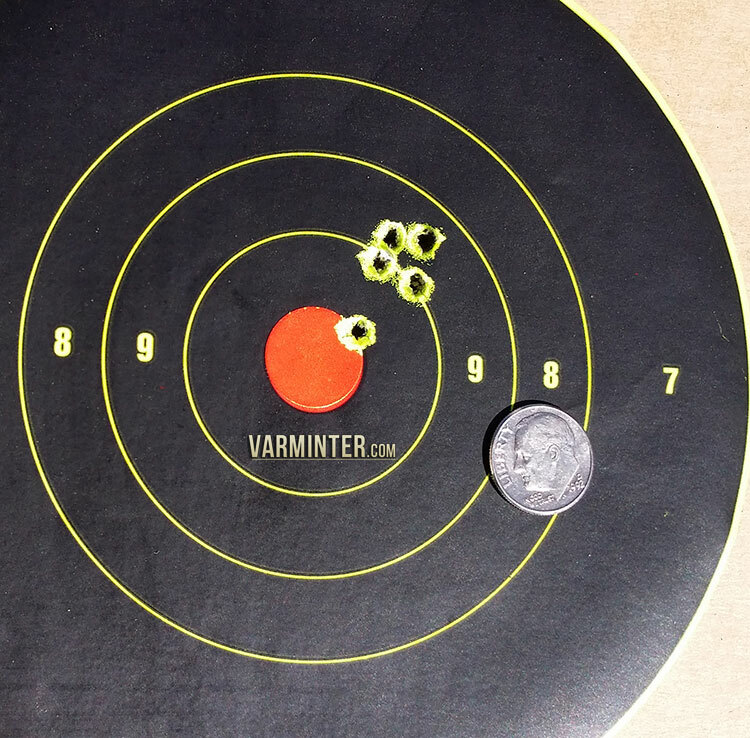 Knowing I was only shooting about 1/2″ low at this range, I put the crosshairs on his head and pulled the trigger. He dropped immediately, rolling over right after the round hit. A few minutes later, we spotted another prairie dog out at 240 yards. When Will found it with the video camera, I confirmed that he had it and then pulled the trigger. The shot hit the mark, right in the shoulder, with the prairie dog rolling over, dead. 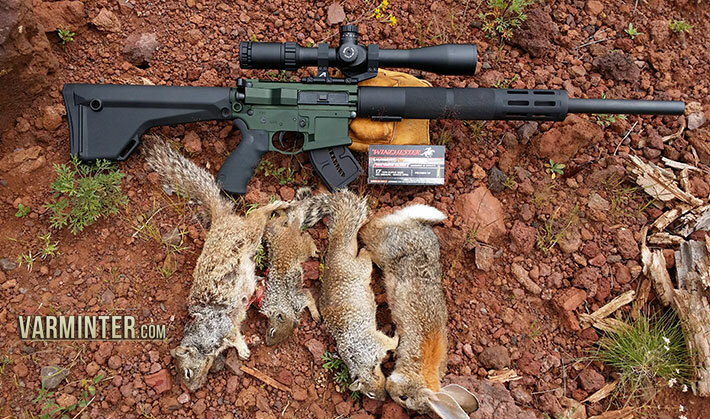 Although I had some experience with this rifle back in California, and earlier in the morning here in Arizona, I was finally able to reach out on some prairie dogs that were past the 200 yard mark and the F17-L did not disappoint. 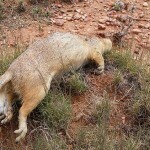 As you will see in the video, I continued to drop prairie dogs the rest of the day. Even with the wind and some misses, the F17-L allowed me some quick follow-up shots that resulted in solid hits. We ended the day satisfied and ready to head back the next morning for more shots. The F17-L spills blood on Arizona soil. We headed back to the same area on Tuesday and ran into even heavier rains than the day before. We parked at the top of a small hill about 15 miles from our hunting spot and waited for an hour or so as the rain turned everything into mini creeks and ponds. I was on the phone with my wife back in Los Angeles giving her locations to check on radar to see if there was any break on the other side of the storm we were in. As soon as she said it was moving East and there was clear areas behind it, we headed into the storm. At 5 miles in, I was wondering if we had made the wrong decision. It was sloppy and the road in front of us didn’t look to be getting any better. However, not 2 miles past that point, the clouds started to break and we saw blue sky off in the distance over our spot. The clearing skies meant more prairie dogs and more shooting. We set-up in the same area and spent the rest of the day shooting prairie dogs at distances from 100 yards out to 250 yards. It was a blast, but we knew that it would be our last day in that area. The next two days we would spend shooting on a private ranch, with many more opportunities to shoot at longer distances. I also wanted to clean the F17-L that evening. After we had put a couple of hundred rounds through it, I experienced a couple of failure to feeds. Because I know how dirty the .17WSM can be and how the 17 rimfires, in particular, are affected by excessive build-up, I recommend that folks pull a couple of wet patches and a dry patch through any 17 rimfire every 100 to 150 rounds. We had a good couple of days and we wouldn’t be getting back to our rooms until at least 9:30 that night, so it was time to head out. 261 Yard shot with the F17-L.
Day four broke clear and much warmer. The storms that had been hitting the area moved on and everything was drying out. We headed to the private ranch that I had shot last year and made the long trek to the spots that performed well for me in the past. As we topped a hill that looked down into a large valley, we saw movement everywhere. There were hundreds of prairie dogs as far as we could see. We quickly pulled over and set-up our gear for shooting. Once again, I set-up the Caldwell Stable Table, while Will was using the Idleback Shooting Chair. I was determined to beat my 240 yard shot from the previous spot, so I started looking for targets out at the 250 yard range. 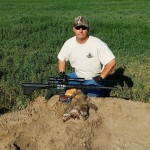 I spotted a lone prairie dog feeding in the grass and ranged him at 261 yards. He kept popping up and down, so I waited for him to stand up for a clear shot. 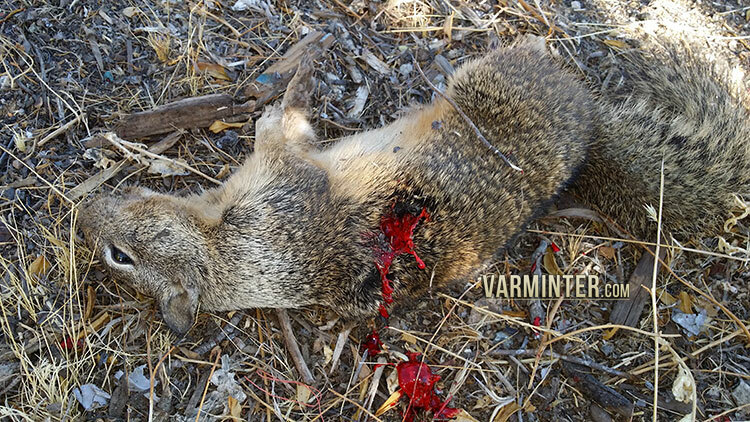 When he finally did, I took the shot, smacking him in the head and causing the 20 grain bullet to exit in various small pieces on the other side. I got it on video and verified the distances when we went down to collect our kills later in the morning. 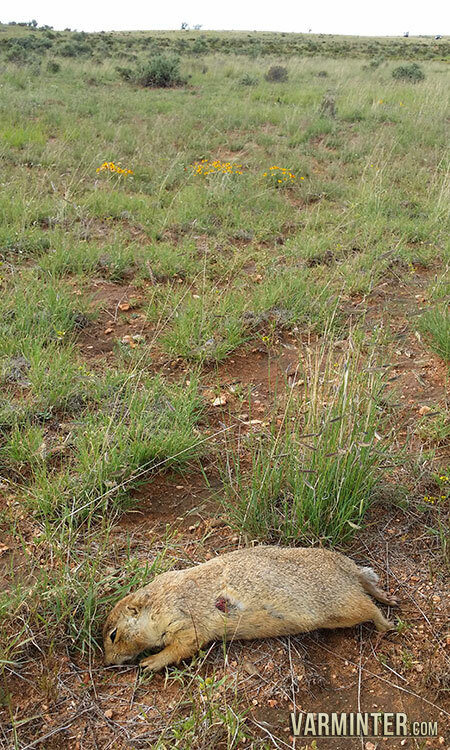 Unfortunately, the prairie dog I killed at 250 yards a few minutes earlier ended up being covered by a portion of a tree, so the video only shows him rolling over and kicking his last (it was not included in the final video). 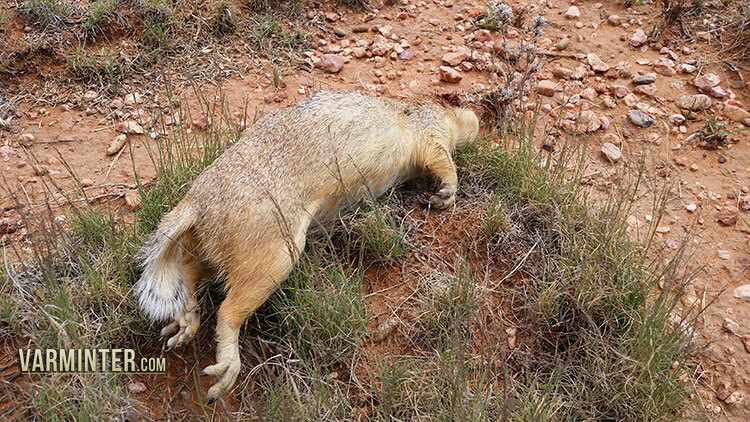 Either way, it was two prairie dogs, one right after the next, at 250 yards and 261 yards. 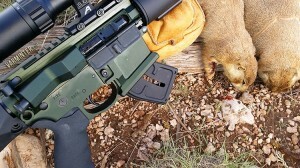 Even that is impressive with the .17WSM, but it is even more impressive out of a semi-auto, AR15 rifle. The F17-L with the 261 & 250 yard kills. I collected a few of my kills and made some notes about the rifle and it’s performance. I would take the F17-L out a bunch more times on this ranch, and every time it left the rifle case, something was going to die. It was almost ridiculous by the end of the day, as it seems both Will and I were cleaning up the prairie dogs with this rifle. Towards the end of the day, I jokingly stopped at the beginning of another short video and said, “How many times are we going to be telling you that we are shooting the Franklin Armory F17-L and that we’re smoking prairie dogs? I give up. We’re killing EVERYTHING!” There is truth in every joke, so I made the decision to put the F17-L away and give another rifle a chance. Colonel Townsend Whelen is quoted as saying, “Only accurate rifles are interesting”. The F17-L has proven itself to me to be an “interesting” rifle. 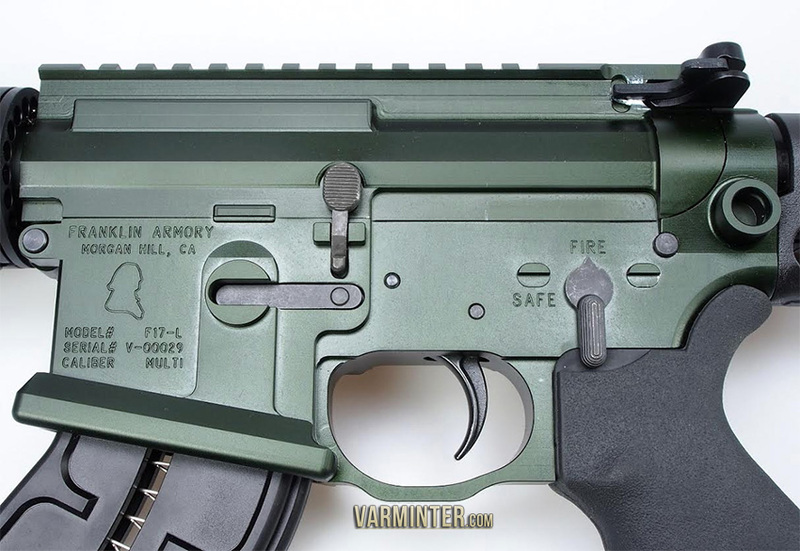 I think Franklin Armory did a great job putting the .17 Winchester Super Magnum in the AR15 platform. The rifle performed well for me, even in the rain, mud, dirt and dust. We only had a few failure to feeds, after a couple of hundred rounds, but a quick clean and/or lube resolved that issue (I made a note above about my thoughts on the frequency of cleaning ANY semi-auto 17 rimfire). I made enough 200+ yard shots with it to convince anyone making the shot that the hits were not a fluke. 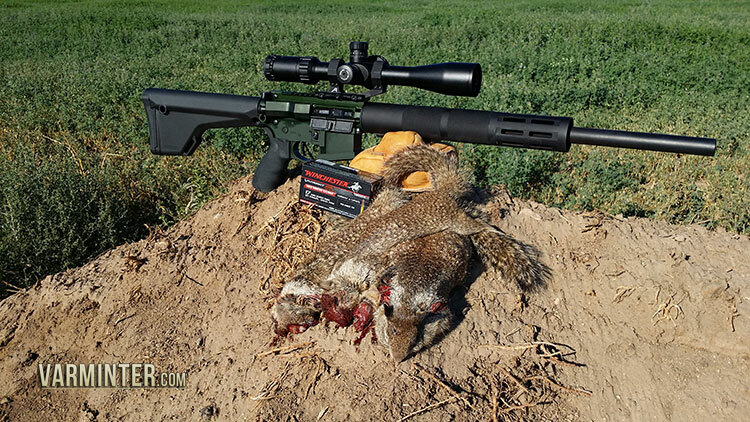 From ground squirrels, to prairie dogs and even rabbits, the little rifle became a killing machine, just wanting to be fed ammo and lube! To top it off, folks in ban states, like California, will be able to use an AR15 like it is supposed to be used, with no bullet button and all the features that make AR15s one of the most versatile rifles available to hunters of all kinds. I know that some folks may balk at the price tag ($1999 MSRP), but the price is in line with other high-quality AR15 rifles on the market. There were no corners cut in the manufacturing of this rifle and I found that the accuracy and functionality I experienced proves that out. The good news is Franklin Armory has already begun shipping the F17-L to gunshops across the country and it will eventually end up on the shelves of Cabela’s as well. The Franklin Armory F17-L in Northern Arizona.